These are so fun! They are delicious when served hot! If you don't have mush time, prepare this tasty and fast recipe. Ingredients: 4 boiled potatoes, salt, pepper, 40g Parmesan cheese, 1 egg, cheese, 50g bacon. 1) Boil and mash the potatoes. 2) Add salt, pepper, and Parmesan cheese. 3) Blend in an egg and add some parsley (if you like it). 4) Slice some cheese into 4 long rectangles and slide them onto the skewers. 5) Cover each slice of cheese with the potato mixture and then wrap 2 slices of bacon around that. 6) Bake at 180°C for 15 minutes. 7) To make the bacon even crunchier, set your oven to grill, or brush the top with barbecue sauce. 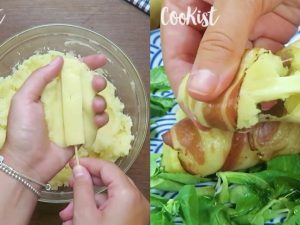 Try also this: Potatoes wrapped in bacon: a unique and fun dinner idea! Ingredients: 500g boiled potatoes, 100g Parmesan cheese, 1 egg, salt, pepper, 150g bacon, mushrooms, as needed. 1)Boil the potatoes, mash them, add salt, pepper, egg and Parmesan cheese. 2) If you want, you can season this mixture with some herbs such as parsley and basil. 3) Next, start weaving the bacon strips together to form a rather large rectangle. 4) Pour half of the potato mixture onto the woven bacon, fill with cheese and mushrooms, cover with the remaining potato mixture. 5) Shape it like a meatloaf and cover the ends with the bacon as well. Flip over the potato roll and bake for about 20 minutes. 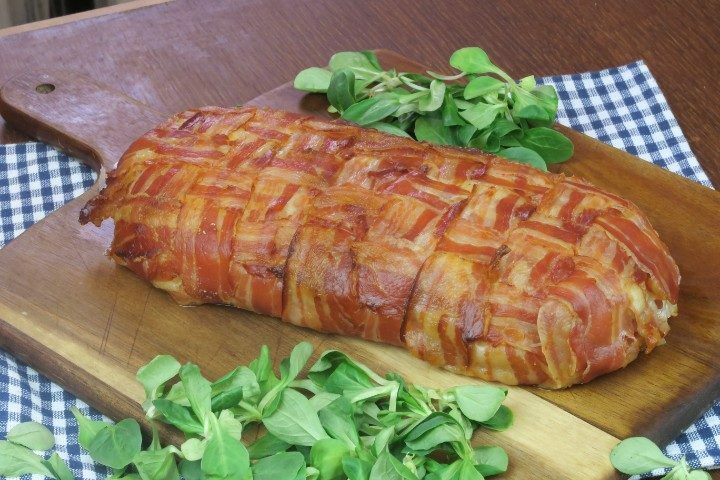 6) To make the bacon extra crunchy, set your oven to grill or top heat for the last 5 minutes of baking.